Hong Kong Disneyland holds Manila auditions on June 12-13, 2015 (Friday & Saturday) at STEPS Dance Studio, Kalayaan Avenue, Makati City. Simba - Male, youthful African Prince destined to become King. Moves well. Pop tenor. Scar - Male, evil uncle to Simba. Menacing presence. Baritone. Nala - Female, beautiful African Princess. Moves well. Pop Soprano. Storyteller - Female, African host who tells the story of "The Lion King". Soulful pop alto. If you are extra flexible, able to perform special skills with that flexibility, you may be what they are looking for! 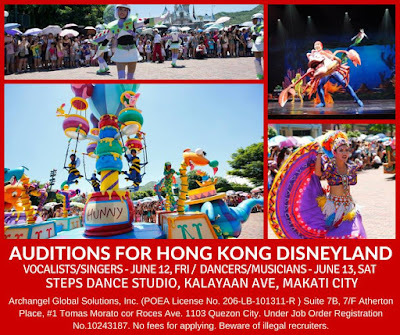 As a Dancer Contortionist, you could have a chance to perform in Hong Kong Disneyland's stage shows, special events, conventions and parades. You may appear both as part of a dance chorus, or as featured soloists. Contortionist must showcase their skills of extreme physical flexibility. Applicants should prepare a short piece demonstrating their musical expertise and showmanship. Performers must be at least 21 years of age and willing to relocate to Hong Kong for the duration of their contract. Brought to you by Archangel Global Solutions, Inc. (POEA License No. 206-LB-101311-R) Suite 7B, 7/F Atherton Place, #1 Tomas Morato cor Roces Ave. 1103 Quezon City. Under Job Order Registration No.10243187. No fees for applying. Beware of illegal recruiters.